You know those times when a restaurant creates a bit of a buzz about it? How it gets mentioned often on twitter and facebook and blogged about endlessly? There are plenty of places that don’t live up to their hype, plenty of places that just have good PR people cooking up a social media storm for them, but which don’t deliver in the dining room. This made me a little apprehensive about Pinche Pinche in Chapel Allerton. All of that beguiling buzz is there, people speaking and writing about it in gushing terms. Could it just be yet another façade masking an insubstantial attempt at knocking out the next big regional cuisine somewhere in Leeds? I couldn’t find anybody with a bad thing to say about it, and that made me suspicious, but now I understand why. Pinche Pinche is that rare restaurant that lives up to its hype. Mexican food isn’t that big in Yorkshire. Taking away the big identikit, cook-it-in-a-factory-and-microwave-it-warm places that spring up on retail parks everywhere, there aren’t many other Mexican places around here. There’s a place in Leeds by the Corn Exchange, and there’s Cocina in Bradford, but it really hasn’t been any good since 1988, and actually, is it still there? 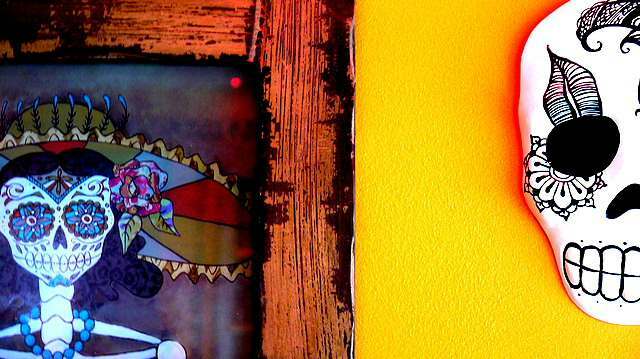 It’s fertile ground for somebody to come in and do Mexican properly, in all its spicy glory. That’s essentially what Pinche Pinche does. I’ve no idea at all if it’s authentic or not – I’ve never been to Mexico – but that matters little. The food is tasty, spicy and delicious. It’s real knock-your-socks-off food, real substantial cooking that feels…right. We had a mixed starter simply because neither of us knows a great deal about Mexican food, and it seemed like an interesting bet. We got a platter of antojitos – Mexican tapas or street snacks – which included a guacamole that I suspect tasted like it should do instead of like my woeful efforts, jalapones stuffed with cream cheese and breadcrumbed and flautas – crisp corn tortilla flutes – filled with marinated prawns. The jalapenos were the best of a very good plate. You could carry on eating antojitos in a Spanish tapas style, and eat very well indeed, but I moved on to a burrito, a chiminchanga actually? What’s the difference? A chimichanga is a deep-fried burrito, the hot oil crisping up the wheat tortilla parcel, making it crunch without making it greasy. It was stuffed with shredded chicken, black beans, Monteray Jack cheese and a tomato salsa. The strength of the salsa is the choice of the diner. Well, I say that…I asked for the hottest one, but I didn’t get it. I grew up in Bradford, and I’ve had the odd proper curry or two, so I reckoned I could take it. The server looked at me with an ‘are you sure?’ faces, which made me pause for a moment, chicken out and knock the salsa choice back a level. Good thing, really, because the salsa in that chimichanga was fierce. It wasn’t a vicious raw heat, a massive chilli flavoured kick in the face. It had depth of flavour beyond the heat, a richness and intensity that knitted the whole chimichanga together. We also had a fajita, that classic Texan/Mexican build-your-own-street-snack dish that was just enormous, a sizzling hot plate of salad and peppers, with thickly sliced chicken blackened on a griddle. Wrap it all up in a tortilla with some sour cream and salsa. Wonderful food, and far too much for one person. 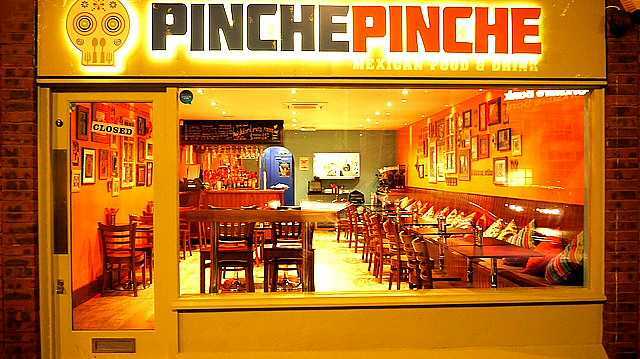 The service at Pinche Pinche was excellent – friendly, quick and engaging. The waitress who quite rightly denied me the killer salsa even waved goodbye when she knocked off for the night. Pinche Pinche is a small restaurant with a growing reputation that’s rightly deserved. It’s food varies from great to astonishing – fresh, tasty, plentiful and beautifully cooked. We had a similarly excellent experience when we went. The food was gorgeous, but it really is the service that makes a restaurant and the bar man and the waitress we encountered were both lovely 🙂 I’m planning on taking some friends there when they come to visit, can’t wait for churros! Truly the food of the gods! Sorry to have to tell you, but Cocina in Bradford is dead! It was taken over by someone about a year ago – they totally trashed the menu and the once we ate there was enough to realise that ‘the old Cocina’ was gone. It’s now closed. Yes, I biked past it today and there was no sign of life at all. Shame, really…it was good in its day. I am one of those that goes on and on about this place. James was also impressed by the service, 2 swigs from the end of his beer he glanced and made eye contact with the waiter already behind the bar gesturing “same again?”. Perfect.